There are two ways to study the spin of this boson, the hard way and the easy way. The hard way involved looking at angles between the final state particles and that’s tricky, but it can be done with the existing data. This method is hard because we have to model both signal and background to get it right. 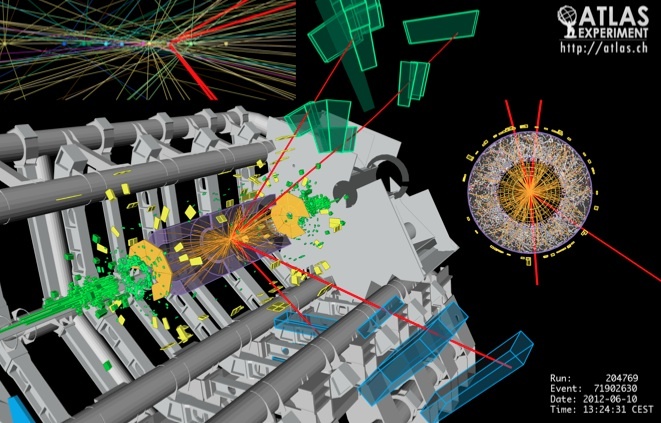 The easy way is to look at the decays of the boson and see which ones happen and which ones don’t. We need a little more data to do this, but we can perform this study by the end the data taking for the year. Richard has already discussed the “hard” method, so I’m going to show the “easy” method. It comes with nice pictures, but there are a few subtleties. 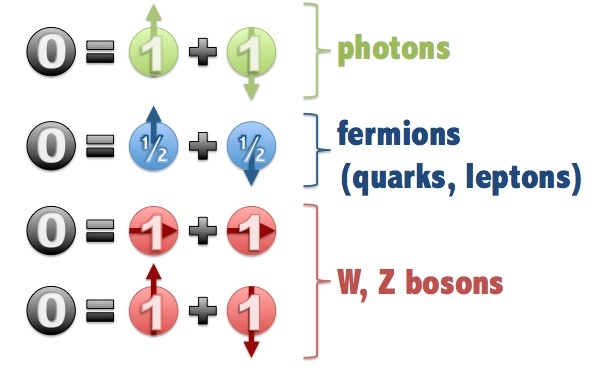 I want to consider four decays: a decay to two photons, a decay to two \(Z\) bosons (the same applies to two \(W\) bosons), a decay to two \(\tau\) leptons, and a decay to two \(b\) quarks. 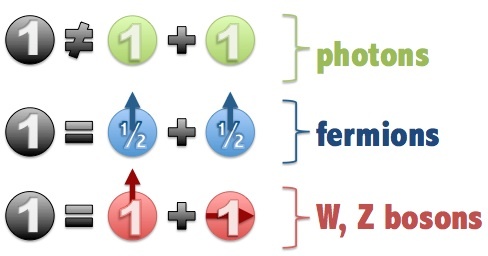 All of these decay modes should be seen by both experiments if what we have seen is the Standard Model Higgs boson. Let’s take the electron and work out what spin states it can have. The electron’s total spin has been measured to be 1/2, so we need to project this spin onto an axis and find out the allowed values. A little thought shows that there are only two states that can exist: spin +1/2 and spin -1/2 (which we call “spin up” and “spin down”.) The \(J/\psi\) meson has spin 1, so it’s allowed states are +1, 0, -1. When the \(J/\psi\) is in state spin 0 what really mean is that it has “hidden” its spin at 90 degrees to the axis, so it’s total spin is still 1 and its projection along our chosen axis is 0. It looks like we can a spin 0 particle by combining any of our particles. Uh-oh, it looks like we can’t make a spin 1 particle from photons! To align the spins correctly the photons must be in an antisymmetric state, which is absolutely forbidden by Bose-Einstein statistics. (Incidentally the term “boson” comes from the name Bose.) That means that this new boson is definitely not spin 1, because we see it decay to two photons. So that means we have to do things the hard way to measure the spin of this new particle. For those who are interested, one of the main challenges presented here comes from the “acceptance” of the detectors- the kinematics of the final states we observe are significantly biased by the geometry of the detector. Even for a spin-0 boson, which decays isotropically, the distributions of the final decay products in the detector will not be isotropic, because the detectors do not have completely hermetic coverage. Fortunately since this post was first written we’ve gathered more data, and detailed studies have been performed eliminating all but the spin 0 hypothesis with a positive parity, indicating that what we have seen is most likely the long sought Standard Model Higgs boson after all. Errata: In the original post I incorrectly made an argument stating that the decay of a spin 2 boson to a pair of quarks would be significantly more probable than the decay to a pair of leprons. Following discussions with Frank Close and Bob Cousins it was pointed out that well established graviton models would give a tensor interaction that would decay to leptons roughly 2% of the time per lepton flavour, making these final states accessible to the LHC experiments, and likely before the dijet final states would be accessible. My thanks go out to Close and Cousins for their correction.